According to the long-range weather forecasts, this winter is predicted to be only slightly colder than normal with several possible days of snow in January and February. Fortunately, the temperatures are not expected to be as low and long lasting as last year’s bone-chilling months. Despite these encouraging predictions, I plan to sit by the fire, sip hot tea and read from a tall stack of gardening books. In the pile beside my chair, two volumes offer unusual perspectives on gardening. I was acquainted with many of the folklore tips for best gardening from listening to my father as we dropped seed into his brown Texas soil. What I didn’t realize was how this advice was accepted and spread by magazine and newspaper articles published primarily in the early 1900’s. Many of the mythical requirements, such as annually turning gardening soil, planting marigolds to deter garden insects and needing the color red to attract hummingbirds, have been proven incorrect by modern science. 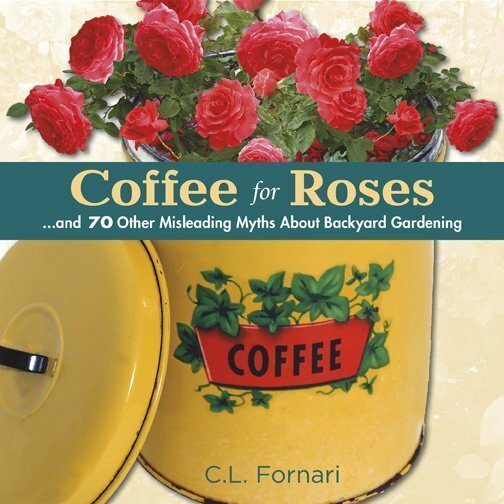 By dispelling these myths and furnishing more current information on what works better, and usually with less work, the author supplies a book filled with interesting methods of gardening from the past and for the present. Growing vegetables often creates an unattractive site on anyone’s deck or yard. 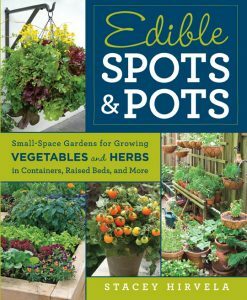 Edible Spots and Pots (Rodale Press, 2014) by Stacey Hirvela will be helpful to beautify the vegetable gardens of those with tiny yards or only a patio or deck. The author begins by explaining how to choose containers and how growing healthy plants in pots differs from in-ground planting. A chapter on raised beds discusses the many materials available for their construction. A “gardening school” chapter and a chapter of detailed plans for simple garden projects, such as the construction of trellises, containers, and shelves made from bamboo, fabric, metal or wood, are provided. The book concludes with instructions on how to raise every known vegetable and herb from familiar okra to an herb new to me, stevia, which sweetens foods. The most unique facet of the book is her “thriller-filler-spiller concept” on how to attractively arrange vegetables in various-sized containers. This process involves arranging tall, medium-height and cascading plants in pots. Hirvela provides 20-plus combinations of vegetables and herbs that will be both productive and visually appealing. This spring I will discard the gardening myths from my childhood and augment my pots and beds with healthier, more attractively arranged vegetables.